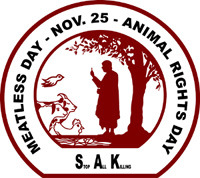 25 November is International Meatless Day, Animal Rights Day, SAK (Stop All Killing). This is a concept developed by those who concurred with Sadhu Vaswani when he proclaimed that the creation of God is bound by the golden chains to the Feet of the One God, the One Divine Father of us all. People are requested, in recognition of this ideal, to refrain from eating non-vegetarian food on this day. Since this concept was developed this movement has gathered infinite momentum and the last few years have seen pledges from well over 10 million across the globe. Such has been the consciousness that a number of states in India voluntarily shut their abattoirs on that day. However, this is not enough and we need to endeavour to move more people to this level of consciousness. Dada J P Vaswani believes that the 21st century will bear witness to the establishment of rights to animals. He has tirelessly led a crusade for animal rights. STOP ALL KILLING. He believes that there should be a Charter of Animal Rights and a Charter of Man’s duties towards the animals. Animals have certain fundamental rights. And the very first right of every animal is the right to live. Here is a Pledge Form. Kindly print or forward it to as many of your contacts as possible. Either post the forms to the address shown at the bottom of the form or scan them and email to the address shown. Please remember we want these forms by 20 November 2015. I am a vegetarian. Do I still need to pledge? Yes, you may pledge to do an act of kindness to a bird or an animal on that day. Do I have to remain a vegetarian for life? No you don’t but you must refrain from foods of violence on 25 November. However, it would be good food for thought if you considered becoming a vegetarian for life. I pledged last year, do I have to pledge again? Yes, you need to renew your pledge each year. I have already pledged this year. Do I need to pledge again? Thank you for pledging. You don’t have to pledge again. It stands for Stop All Killing. We are taught that we must create and foster reverence for All Life, in the belief that ALL Life must be regarded as sacred.